Question: "How can someone who is pro-life oppose abortion and yet be in favor of the death penalty?" There is not the slightest contradiction in being opposed to the murder of the innocent, while also favoring the the lawful execution of the guilty. There is also nothing in either Scripture or Tradition that calls for opposition to the death penalty, when justly imposed. And what you won't find is any Father of the Church interpreting this passage in a way that dismisses it as only relevant to those in the Old Testament, or otherwise not applicable to us. Instead they affirm this as a necessary restraint on fallen man's impulse to murder. 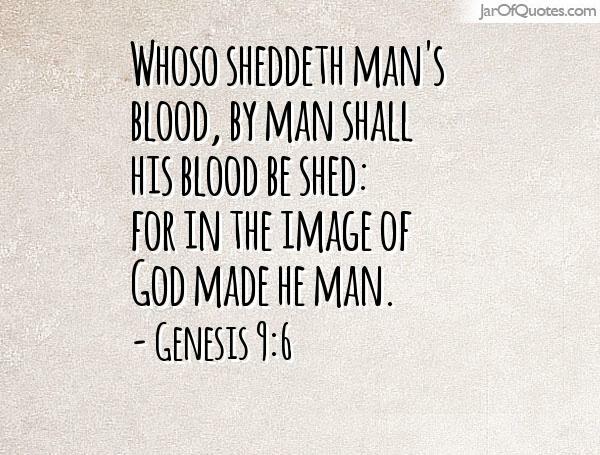 ""I will require your blood from every beast and from the hand of man" [Genesis 9:5]. He requires it now and in the future. He requires it now in the case of a death that He decreed for a murderer, and also a stoning with which a goring bull is to be stoned [Exodus 21:28]. At the end, at the time of the resurrection, God will require that animals return all that they ate from the flesh of man. 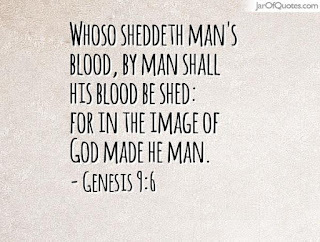 God said, "From the hand of man and of his brother I will require the life of a man," [Genesis 9:5} just as satisfaction for the blood of Abel was required from Cain, that is, "whosoever sheds the blood of man, by man shall his blood be shed" [Genesis 9:6]. The phrase "in the image of God He made..." [Genesis 9:6], concerns the authority for, like God, he has the power to grant life and to kill" [Commentary on Genesis 6:15:1-2 (The Fathers of the Church: St. Ephrem the Syrian, Selected Prose Works, trans. Edward G Matthews, jr and Joseph P. Amar; Kathleen McVey, ed. (Washington, D.C.: Catholic University of America Press, 1994), p. 143). The purpose of a sword is not merely decorative. It is an instrument for killing people, and St. Paul says that the power to punish evil doers with the sword is a God ordained power delegated to civil authorities... even unbelieving or pagan civil authorities. And again, you do not find any Father of the Church trying to find a way to negate the plain meaning of the text, but rather, they affirm it. "You see how he hath furnished him with arms, and set him on guard like a soldier, for a terror to those that commit sin. “For he is the minister of God to execute wrath, a revenger upon him that doeth evil.” Now lest you should start off at hearing again of punishment, and vengeance, and a sword, he says again that it is God’s law he is carrying out. For what if he does not know it himself? yet it is God that hath so shaped things. If then, whether in punishing, or in honoring, he be a Minister, in avenging virtue’s cause, in driving vice away, as God willeth, why be captious against him, when he is the cause of so many good doings, and paves the way for thine too? since there are many who first practised virtue through the fear of God. For there are a duller sort, whom things to come have not such a hold upon as things present. He then who by fear and rewards gives the soul of the majority a preparatory turn towards its becoming more suited for the word of doctrine, is with good reason called “the Minister of God” (Homily 23 on Romans). "It is clear that rulers have been appointed so that evil will not occur. There we must be warned that if someone stands in contempt of the law, the ruler will punish him. Since God has ordained that there will be a future judgment, and he does not want anyone to perish, he has ordained rulers in this world who, by causing people to be afraid of them, act as tutors to mankind, teaching them what to do in order to avoid future punishment" (Ambrosiaster, Ancient Christian Texts: Commentary on Romans and 1-2 Corinthians, trans. and ed. Gerald L. Bray (Downers Grove, IL: Intervasity Press, 2009) p. 96).p. 101). "It must be remembered that power was granted by God, and to avenge crime the sword was permitted; he who carries out this vengeance is God's minister (Romans 13:1-4). What motive have we for condemning a practice that all hold to be permitted by God? We uphold, therefore, what has been observed until now, in order not to alter the discipline and so that we may not appear to act contrary to God's authority" (Ad Exsuperium, Episcopum Tolosanum, PL 20,495). "But the other answering rebuked him, saying, Dost not thou fear God, seeing thou art in the same condemnation? And we indeed justly; for we receive the due reward of our deeds: but this man hath done nothing amiss" (Luke 23:40-41). And in Matthew 15:1-9 and Mark 7:1-13, Christ mentioned the death penalty which the Law of Moses imposed on those who dishonored their parents without any suggestion that this was either unjust or no longer valid. 1. The Ten Commandments say "Thou shalt not kill." The problem with this argument is that the word in question clearly means murder, rather than killing in the context of war, or of an execution. 2. St. Nicholas interceded to save men who were condemned to death. "Let us all praise Nicholas, the great archpastor, hierarch and prelate of Myra; for he saved many men who were unjustly condemned to be executed, appearing to the emperor and to Ablavius in a dream, annulling the unjust verdict." He did not annul a just verdict, nor did he ask for a just verdict to be commuted. 3. St. Vladimir, after he converted to Christianity, abolished the death penalty. Also true, but with the encouragement of the Church, he also reinstated it. "The death penalty as a special punishment was recognised in the Old Testament. There are no indications to the need to abolish it in the New Testament or in the Tradition or in the historical legacy of the Orthodox Church either. At the same time, the Church has often assumed the duty of interceding before the secular authority for those condemned to death, asking it show mercy for them and commute their punishment. Moreover, under Christian moral influence, the negative attitude to the death penalty has been cultivated in people’s consciousness. Thus, in the period from the mid-18th century to the 1905 Revolution in Russia, it was applied on very rare occasions. For the Orthodox church consciousness, the life of a person does not end with his bodily death, therefore the Church continues her care for those condemned to capital punishment. The abolition of death penalty would give more opportunities for pastoral work with those who have stumbled and for the latter to repent. It is also evident that punishment by death cannot be reformatory; it also makes misjudgement irreparable and provokes ambiguous feelings among people. Today many states have either abolished the death penalty by law or stopped practicing it. Keeping in mind that mercy toward a fallen man is always more preferable than revenge, the Church welcomes these steps by state authorities. At the same time, she believes that the decision to abolish or not to apply death penalty should be made by society freely, considering the rate of crime and the state of law-enforcement and judiciary, and even more so, the need to protect the life of its well-intentioned members" (Section 9:4). And so, while this statement provides a number of reasons why one could oppose the death penalty, none of them are to be found in Scripture or Tradition. Chisinau, October 12, Interfax - Death penalty is acceptable in special cases, but existing judicial system cannot provide its justified use, Patriarch Kirill of Moscow and All Russia believes. "I'm against death penalty in today's Russia. Today to get rid of a competitor, they order a killer. Considering current state of our courts, if there's a death penalty, people will be "removed" legally. And it's a great danger," the Patriarch said in his interview with Moldavian, Romanian TV channels and Rossiya-24 TV. According to him, there have already been several cases "when suddenly, in the last moment, it was cleared out that the person wasn't guilty." "Thus if we speak about bringing back death penalty in some concrete cases, when we refer to maniacs, mass murders, terrorists, but we should have absolutely strong evidence that the person committed it and he wasn't forced to take this guilt, such things can take place in future," Patriarch Kirill believes. The Primate reminded that the church tradition does not condemn or refuse death penalty, Christ Himself "was crucified, He went through death penalty, but He has never said that criminals shouldn't be executed and holy fathers don't say it either"
"Rejection of death penalty is not the result of Christian tradition, but the result of a new liberal philosophic idea that appeared in West European space," he said. The Patriarch noted that though the Church had never spoke against death penalty, it spoke against applying it and there were only seven or eight cases of death penalty in the Russian Empire for more than hundred years (Interfax, 12 October 2011, 10:41, Patriarch Kirill against introducing death penalty in modern Russia). Patriarch Kirill was expressing his own opinion about the death penalty, and did not rule it out in some cases. His primary concern seems to be with the quality of the criminal justice system in contemporary Russia. But like the Social Concept document, he notes that there is nothing in Scripture or Tradition that requires opposition to the the death penalty. Metropolitan Anthony (Khrapovitsky), in his essay "The Christian Faith and War," took a much more favorable view of the death penalty. Orthodox Christians are free to oppose the death penalty if they wish, and many people whom I greatly respect do so. One could argue that in ancient times, life in prison was not a practical option for society, but it is today, and so we should reevaluate the need for the death penalty. You could argue that we spend far too much money on death penalty cases, and that it would be wiser to opt for life in prison. You can point out that life in prison gives prisoners more time to repent. And many other arguments can be made which would try to persuade others that it would be wiser to choose other options. However, what one cannot argue is that either Scripture or Tradition require one come to such conclusions, because clearly this is not the case. *"Ambrosiaster" is the name given to the author of commentaries long attributed to St. Ambrose of Milan, but which scholars believe to have been written by a later author.